The PC gaming industry is always vying for your attention with new and exciting technology, with graphics-card manufacturers in particular looking to one-up one another with bundled games and software enhancements. 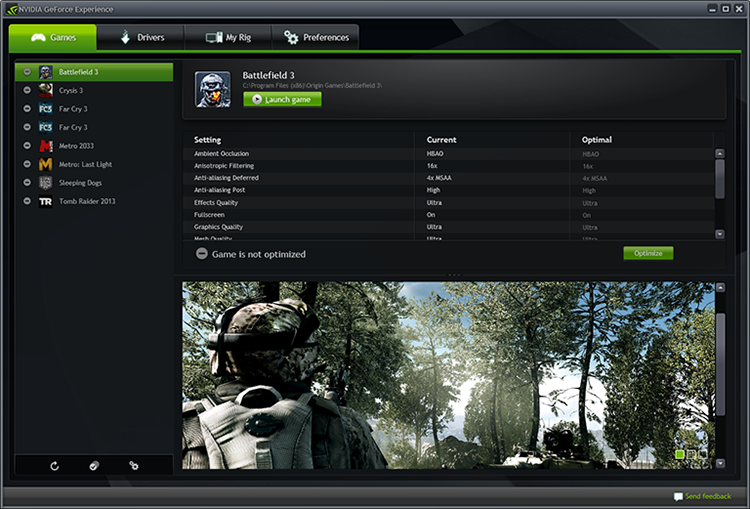 One of the most recent offerings is auto-optimisation for your PC games. The premise is simple: had enough of stuttering framerates and struggling to get your head round the likes of FXAA, TressFX and Ambient Occlusion? Then not to worry, hit optimise and your GPU manufacturer will automatically configure the optimal settings for your PC. Sounds a useful addition, and hundreds of games are supported by Nvidia's GeForce Experience and AMD's Raptr-powered Gaming Evolved. But then, we're PC gamers, and we're renowned for our proclivity for tinkering, so do automatic optimisations offer much appeal? To find out, we're putting the question to you: do you auto-optimise your PC games? If you do, let us know how much success you've had and with which software, and if not, give us your reasons why. Have a tech-related question you'd like to see featured as the HEXUS QOTW? Send it over using our contact form and it may well appear. We're always open to ideas, and while we can't promise that all questions will be published, we'd love to hear your suggestions. I personally don't at all, though I did for GTA V and it somehow gave me a miraculous performance increase despite using the same settings I had set for myself as far as I could see. That's the only time I've really seen a benefit to it though, it tends to turn on stuff like VSync and Anti-Aliasing that I dont personally see the need for. No. GeForce Experience doesn't work with my card, and Raptr doesn't properly support GOG, and the games it did support didn't seem to make much of a difference when it did optimize them. No. I think some of the fun is in tweaking the settings of the game to find the right balance of performance and I always found on GeForce Experience that the settings were never good for my machine. The settings were either too high and my FPS struggled or it was too low and I weren't getting the best visuals I could. Not for me. I try to find the best balance between image quality and performance based on what I prefer. That said, I do understand why these “auto-optimised” stuff is here though. There's lots of people who wouldn't want do deal with graphics settings and for those looking to buy a SFF PC as a game console, they also probably want the convenience. just stick everything on high see if it works if not the game normally does it for you and you tweak from there ..